Studio Line: Warner Bros. - Heroes Of Their Time…And For All Time. The Inspiring Tale Of The Warsaw Ghetto Resistance. Homemade bombs rain from rooftops onto the street. Rifle fire erupts from windows. Jewish men and women of Warsaw, Poland, are fighting back against their oppressors. History's largest campaign of armed Jewish resistance to Nazi tyranny during World War II is in its full fury. Directed in brisk, semi documentary style by Jon Avnet, Uprising is a remarkable story remarkably told, a poignant and powerful saga of undaunted heroism. Leelee Sobieski, Hank Azaria, David Schwimmer, Jon Voight, Donald Sutherland, Cary Elwes, Stephen Moyer and others star in this fact-based tale that stirs the emotions and touches the heart. DVD: Widescreen 1.78:1/16x9; audio English Dolby Digital 5.1; subtitles English, French, Spanish; closed-captioned; single sided - double layered; 39 chapters; not rated; 177 min. ; $24.98; 12/18/01. Supplements: Audio Commentary With Director Jon Avnet; Audio Commentary With Actors Hank Azaria, David Schwimmer, Jon Voight, and Leelee Sobieski; “Resistance” Documentary; “Breaking Down the Walls: The Road to Recreating the Warsaw Ghetto Uprising” Documentary; Trailers; Cast/Crew Film Highlights. Uprising posits a provocative question. When faced with deadly evil, is it better to submit and do what one can to survive, or should one go down screaming in the face of unbeatable odds? The film clearly takes the former position, but it covers both sides of the equation. Unfortunately, it does so in a way that leaves little room for subtlety or discussion. Uprising follows the Jewish resistance that occurred in Poland during World War II. About a year after the September 1939 German conquest of that country, the Nazis isolated roughly 400,000 Jews within a small area of Warsaw. Allotted starvation rations and not permitted to leave the area, many perished, but they didn’t do so rapidly enough for the ruling parties. As such, in the summer of 1942, they were to be removed from the area altogether and sent to concentration camps. Over a period of a few months, about 300,000 prisoners were “resettled” to Treblinka. When in January 1943 Himmler discovered some 60,000 Jews remained in Warsaw, he ordered that they be removed by February 15. Due to a variety of factors, that didn’t happen. A harsh winter and the lack of adequate transportation created difficulties, as did the behavior of the prisoners themselves, many of whom refused to go quietly. In Uprising, we see the manner in which the Nazis treat the Jewish prisoners isolated in the “Warsaw Ghetto” and observe as their leaders - mainly Adam Czerniakow (Donald Sutherland) - try to work with their oppressors to keep the whole group alive. Inevitably, this doesn’t work - you can’t bargain or negotiate with the Nazis - and the situation deteriorates as the “resettlement” occurs. Understandably frustrated with their plight, a small group of Polish Jews take up arms and fight back against the Nazis. Mainly led by Mordechai Anielewicz (Hank Azaria), this crew set up camp and fought off their enemies for about a month. Despite the much more powerful forces deployed by General Juergen Stroop (Jon Voight), the Jews managed to keep them at bay for weeks. Shockingly, the resistance of this tiny band of rebels lasted longer than the battle for Poland itself in September 1939. Some subjects are sacred cows, and it can be difficult to discuss projects that focus on them. Anything that touches on the Holocaust almost automatically attains a wall around it that makes it impervious to negative comments. Some see the topic itself as being all-important and interpret criticism as an attack on the worthiness of the subject itself. That’s not the way it should be; subject matter shouldn’t make any project beyond reproach. On the positive side, I definitely respect what writer/director Jon Avnet wanted to do with Uprising. For so long, the Jews affected by the Nazis have been seen as passive folk who simply fell down and died. Clearly that wasn’t the case across the board, and it’s good to hear a tale of significant resistance. Going in we know that it won’t be totally successful, but sometimes the act itself is more important than the outcome, and the strength of the people involved in the rebellion delivers a powerful message. Unfortunately, Avnet cloaks the tale in such broad and ham-fisted imagery that it loses a lot of its impact. Much of the promotional material attached to Uprising touts that it uses a “documentary style” to tell the story. By “documentary style”, they apparently mean a lot of shaky, hand-held camerawork. When I hear that phrase, I think of a certain level of objectivity and a lack of emotional involvement in the subject. That isn’t what we find during Uprising. Yes, there’s lots of jerky camerawork, but that’s the extent of the “documentary” focus. Instead of a dispassionate observational style, Avnet infuses the film with an excess of subjectivity. It always remains patently obvious where his passions lie; any façade of impartiality falls by the wayside very quickly. To a degree, I don’t see this as a bad thing. Some projects related to World War II seem excessively even-handed to the point where they partially negate negative behavior. That was my biggest complaint about Tora! Tora! Tora! and its look at the attack on Pearl Harbor; it treated the Japanese without any negativity toward their vicious actions. At least one could view those occurrences as part and parcel of war. Obviously the behavior of the Nazis enters a totally different territory and cannot - and should not - be seen in a totally non-judgmental manner. However, Avnet takes this over the top. His Germans are such textbook cartoon baddies that I often expected to see them twirl their moustaches and cackle maniacally. Voight and some others attempt to imbue their characters with a little reality, but they’re overwhelmed by the tone Avnet strives to portray and they turn into simple stereotypes. Many times it feels like we see Nazi atrocities simply to provoke an emotional reaction, not to tell the story. No, I don’t expect - or want - sympathetic Nazis, but Uprising made them far too simple. On the other side of the equation, the Jews are rarely seen as anything more than positive and heroic. Granted, those characters feature more subtle shading than the Nazis, but they still remain blandly brave and they lack a lot of nuance. Ironically, the only role that really develops involves a guy who initially cooperated with the Nazis as part of a Polish police force but who alters his views when he see some of their terrible actions. A small part, this one offers the only real growth and change seen in the film. On occasion, Avnet indulges in some graphic content, mainly related to violence. I suspect that Uprising would be rated “PG-13” were it to run theatrically, but since it originally aired on network TV, the material can be more explicit than one might expect. However, make no mistake about the nature of the project itself; Avnet’s style is TV-movie all the way. With films like the execrable Fried Green Tomatoes under his belt, Avnet was the wrong person to create a rich and involving tale of the Jewish resistance. At its heart, Uprising tells a fascinating and powerful tale, but the movie itself seems too broad and overly emotive to do justice to the subject. I respect the film and its motives but found the result to be less than satisfying. Odd casting footnote: at times we see the interaction of Yitzhak Zuckerman (David Schwimmer) and Frania Beatus (Alexandra Holden). If they look familiar together, that’s because Holden briefly played Ross’ very young girlfriend Elizabeth on Friends. How strange that they’d end up together again in this kind of piece! 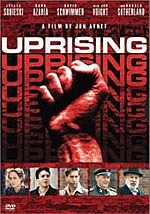 Uprising appears in an aspect ratio of approximately 1.78:1 on this single-sided, dual-layered DVD; the image has been enhanced for 16X9 televisions. The picture showed a few concerns, but as a whole, it seemed pretty satisfying. Sharpness consistently looked very good. At all times, the image remained crisp and detailed. I saw no signs of softness or fuzziness. A little edge enhancement crept in on occasion, but this stayed minor, and I witnessed no problems related to moiré effects or jagged edges. Print flaws were fairly modest, though they seemed heavier than I expected for a brand-new project. Light grain appeared with moderate frequency - particularly during low-light interiors shots - and I also saw occasional examples of speckles and grit. These never appeared intense, and they lessened as the movie progressed, but I still thought the picture came across as a little dirtier than expected. As one would expect from this sort of project, Uprising offered a rather subdued palette most of the time. Nonetheless, the colors we saw seemed solid. The hues always appeared accurate and well defined, and I noted no concerns related to noise, bleeding, or other issues. Black levels also looked deep and dense, while shadow detail came across as appropriately heavy but not excessively thick. Ultimately, Uprising offered a reasonably positive image. Similarly good but not great was the Dolby Digital 5.1 soundtrack of Uprising. Initially, the soundfield accentuated a surprisingly forward emphasis. During the first half or so of the film, even battle scenes seemed heavily oriented toward the front. Within that domain, the audio showed good definition and delineation. Music displayed fine stereo imaging, while effects spread clearly across the main speakers. Though those elements often blended together well, they also seemed somewhat speaker-specific at times; panning didn’t occur in a tremendously smooth manner, and sometimes street scenes appeared a bit sterile because the stems stayed too strongly in their own domains. Though they largely remained passive during the first half of Uprising, the rear channels came to life more fully in later segments. When the movie featured more intense battle action, the surrounds added very good reinforcement, and they created a nicely lively and believable environment. It seemed odd that they stayed so quiet during the first half, as that section included a number of sequences that would have benefited from their use, but at least the track rebounded in later segments. Audio quality seemed consistently fine. Speech appeared natural and warm throughout the film, as the dialogue betrayed no concerns related to intelligibility or edginess. Music sounded bright and rich, and the score offered solid fidelity with good depth. Similarly, effects demonstrated nice range. They provided clean highs and deep bass when appropriate, which made them appear lively and accurate. Overall, the soundtrack suffered a little from its periodic lack of ambition, but it came across as a satisfying program nonetheless. This 2-DVD set of Uprising includes some supplements. Since the movie lasts almost three hours, little other than audio supplements appear on the first disc. There we find Cast and Crew listings for writer/director/producer Jon Avnet, screenwriter Paul Brickman, and actors Hank Azaria, David Schwimmer, Leelee Sobieski, Stephen Moyer, Mili Avital, and Donald Sutherland. Also on the first DVD are two full audio commentaries. One concentrates on the performers. During this piece we hear from actors David Schwimmer, Hank Azaria, Jon Voight and Leelee Sobieski. The three men were recorded together, while Sobieski was taped separately and her comments were inserted into the proceedings at logical points during this fairly screen-specific piece. Overall, I found the track to seem sporadically compelling. At times, we learn some reasonably good tidbits about the history behind the tale. The actors add some nice notes about their real-life characters, and they also provide some useful information about the shoot itself and how difficult it could be to deal with such brutal material. However, we have to sit through a number of fairly long empty spaces throughout the piece; these intensify as the movie progresses, and I believe Schwimmer actually leaves at one point, though he returns by the end. In addition, the track seems somewhat self-congratulatory at times, as it includes an awful lot of remarks about how good everything/everyone is. As a whole, it’s still worth a listen, especially for fans of the film, and for some reason, I find the idea that three performers like Schwimmer, Voight and Azaria sat together for the piece is very cool. Nonetheless, it’s somewhat lackluster. The second commentary comes from director Avnet all on his own. He’s recorded solo for this fairly screen-specific piece. Overall, Avnet offers a reasonably decent track, though his style is a little disconcerting. During much of the commentary - especially over the second half of the movie - Avnet doesn’t provide much of a running discourse. Oh, he talks most of the time, but he tends to offer a sentence or two about an issue, and then he briefly pauses until he gives us another sentence or two about something else. He doesn’t often get into a protracted chat about issues. As such, he covers a lot of ground, and the track really does suffer from very few empty spaces, especially given the length of the film. At times, Avnet tends toward self-congratulatory remarks, and he simply relates the on-screen action too much of the time. One unintentionally humorous tendency relates to his frequent claims of veracity for the film. Does this mean that when he doesn’t point out the truth behind a scene that it’s not real? However, Avnet does provide a fair amount of good information. He goes over production details as well as historical background and a mix of other topics. I still think he gives too much praise, and his style seems off-putting, but this remains a fairly positive commentary. On DVD Two, we find only a few extras. Most significant are two documentaries. Breaking Down the Walls: The Road to Recreating the Warsaw Ghetto Uprising offers an 18-minute and 20-second look at the creation of Uprising. It provides the standard combination of shots from the set, movie clips, and interviews with principals. In the latter domain, we hear from Avnet, Sobieski, Azaria, Schwimmer, Donald Sutherland, production designer Benjamin Fernandez, costume designer George Little, and Simcha Rotem, the real-life person behind the Kazik character. As a whole, this was a reasonably interesting piece. We learned a fair amount about the production and the challenges it presented. However, it suffered from a fairly puffy tone much of the time. The show included some good background information and behind the scenes material, but mainly it came across as a vehicle to promote the project. As such, it seemed a little light on useful details and heavy on endorsement. Next we find Resistance, a 28-minute and 45-second program that looked at the historical elements behind the project. It mainly focused on period documents and new interviews with a mix of parties. From Uprising itself we got comments from Avnet as well as actors Azaria, Jon Voight, John Ales, Cary Elwes, and Sutherland. In addition, we heard from Warsaw Ghetto resistance fighters Rotem, Vladka Mlad, and Marek Edelman, Holocaust scholar Dr. Michael Berenbaum, authors Robert and Betty Jean Lifton, and Professor John K. Roth. Though it also suffered from some of the superficial nature seen in “Walls”, “Resistance” seemed like a more satisfying program, largely because it put more of an emphasis on the real-life participants. Frankly, I could have lived without the comments from the actors and Avnet; this program should have focused exclusively on the other parties. Still, it offered enough information from them to be a reasonably interesting and worthwhile endeavor. It helped flesh out the material seen in Uprising and added a nice layer of depth to the project. Although the DVD’s case touts the inclusion of “trailers”, instead we only find one. Simply titled Promo, this 200-second clip advertises Uprising and looks absolutely terrible; the quality of the piece seems atrocious. Lastly, those with DVD-ROM drives will be able to access a few Weblinks. At its heart, Uprising is a very well-intentioned piece, and it does tell an important tale. Unfortunately, it delivers the narrative in a fairly ham-fisted manner that renders it less effective through its black-or-white storytelling. The DVD offers consistently good picture and sound plus a reasonably interesting roster of supplements. Overall, I think Uprising functions well as something that might spark further research into its subject, but the piece on its own seems somewhat unsatisfying.